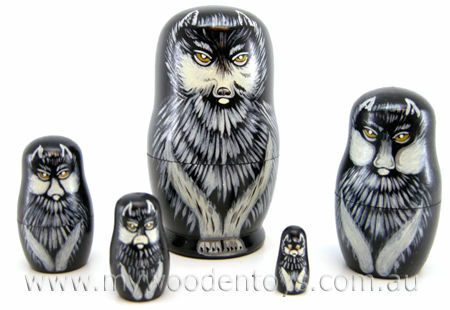 Wooden Wolf Russian Nesting Dolls are a beautiful set of five nesting dolls with a Wolf theme. Each doll has a different painted image and as with all Russian nesting dolls they fit inside each other right down to the smallest doll which has a tiny Wolf Cub painted on it. Russian dolls have been around for generations but this is the first time we have seen a Wolf version... Brilliant! We like this because: "Wolves so cunning they hide one inside the other."